The deadly terrorist attacks earlier this month have cast their shadow on the climate summit in Paris. Indigenous activists marked the day before the climate summit kicked off with a moment of healing outside the Bataclan Theater, where 89 people lost their lives last month. Dallas Goldtooth, an environmental activist from the Indigenous Environmental Network, says that native people have something unique to offer during tragic times like these. The attacks prompted the French government to prohibit all major protests during the UN summit—a decision some climate activists thought was wrong. With the major climate justice march in Paris cancelled, activists turned to symbolic protest. They placed thousands of shoes, including a pair from Pope Francis, in the center of the Place de la République to show the breadth of support for strong action on climate change and a commitment to human rights. And nearly 5,000 protesters defied the ban altogether, forming a human chain that stretched through the city along the planned march route—the two-mile length of Boulevard Voltaire. Activists from all over the world linked arms, including many young people. Wadzanai says she was disappointed that the march was canceled, but she’s happy to see so many people in the streets today. That goal, she says, is fighting to end climate change and to have climate justice. There was a lot of energy on the streets of Paris, but not much excitement about what’s going on inside the negotiating rooms at the UN summit. Among the groups forming the chain was the Women’s Earth and Climate Action Network. Osprey Orielle Lake is executive director, and she says she’s glad that countries are beginning to take climate change seriously but that the national commitments on the table in Paris don’t go nearly far enough. And that’s a life and death concern for many indigenous people on the frontlines of climate change. Warden says that to protect the most vulnerable people, negotiators need to ensure that a lot of the world’s fossil fuel reserves never get burned. Cindy Weisner of the Grassroots Global Justice Alliance has been following the climate negotiations for the past 21 years with frustration, not only with the lack of a meaningful deal, but with the type of solutions that are on the table. Many of the climate activists in the streets of Paris want enforceable commitments on emissions reductions, and they don’t want carbon trading schemes. But Ananda Lee Tan of the Climate Justice Alliance says that’s unlikely because the people at the negotiating table are beholden to powerful corporate and national interests. “What I would call the pollution profiteers are at the table, and the voices who are really demanding systems change rather than climate change are out here in the streets,” Tan says. Tan says that if we really want to solve the climate crisis we need to make our entire economy and energy system truly local. And Cindy Weisner agrees that if we want to solve a problem as big as the climate crisis, we need a just transition—not only from fossil fuels to renewable energy, but from corporate power to people power. “A just transition really begins to build local living economies in communities, where we can begin to talk about energy democracy, zero waste—different solutions that are actually going to cool the planet,” Weisner says. 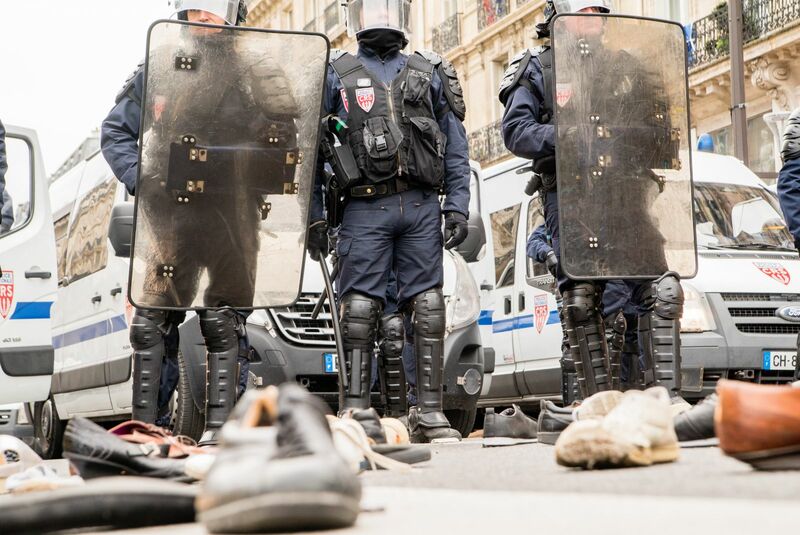 The peaceful protest took a turn as hundreds of police in riot gear surrounded a group of more confrontational, anti-capitalist protesters in the Place de la République. Police fired tear gas canisters into the crowd, and soon the square was filled with a noxious haze. Reports have differed about what sparked the change, but a climate activist who would only give her first name, Sheila, says the police response was unwarranted. After the terrorist attacks, the French police used state of emergency laws to put several climate activists under house arrest, and Sheila says it’s all part of an effort to quash opposition to the conference. “It’s not about safety. It’s about not allowing people to stand up for what they believe in and to speak out against the COP21,” she says. In order to keep global warming beneath two degrees Celsius, Sheila says we need to fundamentally change the economic system, but that’s not a message that authorities in Paris want to hear. The climate justice movement has found ways to make itself heard during the opening week of COP21, and it isn’t about to stop now. This story is provided by our content partner Living on Earth, a weekly environmental news and information program distributed by Public Radio International. Emmett FitzGerald is a reporter for Public Radio International's Living on Earth.